Vision Optimizer is a synergistic blend of 17 ingredients Elements of the formula such as lutein, zeaxanthin and alpha lipoic acid are effective antioxidants that target the structures of your eyes such as the lenses. Other ingredients promote fine capillary building. You will experience optimum results when using Vision Optimizer along with a high quality multivitamin. Blood vessels inside the eye are very small so it takes a long time to deliver necessary nutrients to the critical structures. Adding to that challenge, your eyes and brain are made of fat and require a long time to change. Results are usually experienced in 3 to 6 months. It takes awhile to give Vision Optimizer a good, fair honest shot. Bill discovered , it’s worth the wait. Vision improvement can be experienced regardless of age. 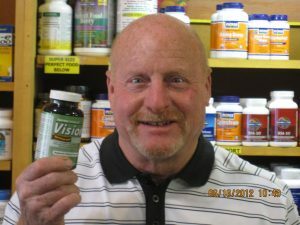 Vision Optimizer provides nutrients for supporting eye health, click here to see lifestyle changes beneficial to vision.